One of five brothers to grace the athletic arenas of Lowell High School, James burned his name into the memories of those who watched him perform on the gridiron and the basketball court through his outstanding athletic ability and his boundless energy. 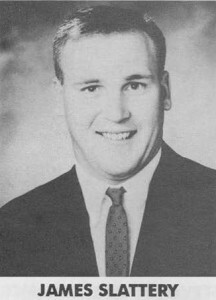 Perhaps the most versatile Raider football player of the 1980’s, James earned Merrimack Valley Conference Honors as both an offensive and a defensive player, including 3 consecutive selections as a linebacker. He was named a Boston Herald All-Scholastic selection after his senior year and played in the prestigious Shiners’ Football All-Star Classic in 1985. James received a football scholarship from Northeastern University, after he was actively recruited by numerous Division I schools, including Boston College and Penn State. On the hardwood, James was a two-year starter and MVC All-Star on Coach Charlie Ryan’s juggernaut squad that captured consecutive Merrimack Valley Conference Championships (1984–1985) and an Eastern Mass North sectional Title (1984). James’ outstanding leadership qualities were exhibited by his role as a team Co-Captain in both sports.